The Discovery astronauts downlinked spectacular video late today showing the international space station during a slow 360-degree fly-around, with its newly installed S6 solar arrays giving the lab complex a symmetric appearance that finally matches the engineering drawings that started the program. Looking at an initial snapshot of the space station taken as Discovery undocked and pulled away earlier today, lead Flight Director Kwatsi Alibaruho called the view "the $100 billion photograph," referring to the lab's presumed price tag. "The photograph kind of shows it all," said Dan Hartman, chairman of NASA's space station Mission Management Team. "We're just very, very proud to see our integrated truss assembly complete, solar arrays deployed. The S6 element is working perfectly, we're working no anomalies associated with it and we couldn't be happier." "We've certainly achieved a very important milestone," Alibaruho said of Discovery's mission. 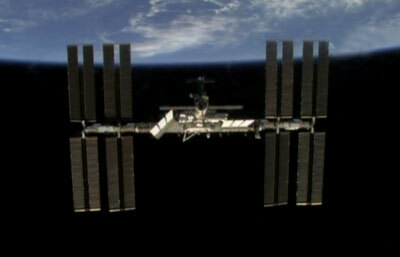 "We had a successful undocking of the space shuttle Discovery from the ISS. The undocking operations were smooth, everything occurred on time, there were no issues and we got all the cargo transferred that we needed to get transferred, including the double cold bags with the science samples. "Those bags containing some 75-plus vials of urine and blood and other biological samples. We got all that stuff packed on the shuttle and ready to come down. We also transferred water samples from the ISS water recovery system. Those samples are the ones that are needed for the post-flight analysis that will be used to clear the system for use by six-person crew. So that was a tremendous success for us. "And of course, the final mission objective ... was making sure we enabled the shuttle to get a good picture of the international space station with the newly installed solar arrays."